Known to millions from his multiple appearances as news anchor 'Rod Remington' on the Fox TV show Glee, Bill A. Jones is also a dynamic singer of The Great American Songbook. 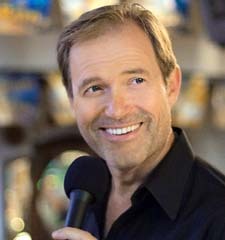 As a vocalist, Bill performs many of the great songs associated with Frank Sinatra, Bobby Darin, Michael Buble, and others - but with his own distinctive flair. Bill has opened for Tony Bennett and Steve Tyrell, toured with The Glenn Miller Orchestra, and released two CDs on CDBaby.com. He was also named one of LA's Best Concert/Cabaret Artists by BroadwayWorld's Don Grigware, and has recently been starring in the national tour of "Battle of the Big Bands: Glenn Miller vs Tommy Dorsey". In addition to Glee, as an actor he's appeared on Workaholics, Powerless, The King Of Queens, CSI New York, Everybody Hates Chris, Las Vegas, Criminal Minds, and many other shows. On TVLand's The Soul Man, Bill played "Stormy Hernandez," recently played Sally Strother's husband in the film You and Me, and appeared as millionaire "Brad Bush" on the long running daytime drama Days of Our Lives. Many still recognize Bill as the "Don't Count That" golfer from a beloved FedEx commercial. And it is possible you may have heard Bill over the airwaves, as he was an award winning radio personality for many years, heard on over 200 stations nationwide via Westwood 1's Adult Standards format. A native of Nashville Tennessee, Bill and his family make their home in Los Angeles. Music Video "River Stay Away"